The beginning of January is always filled with exciting opportunities for a fresh, promising start to the new year. While many are busy making personal resolutions this time of year, we tend to focus on a list of plans and projects for our home. 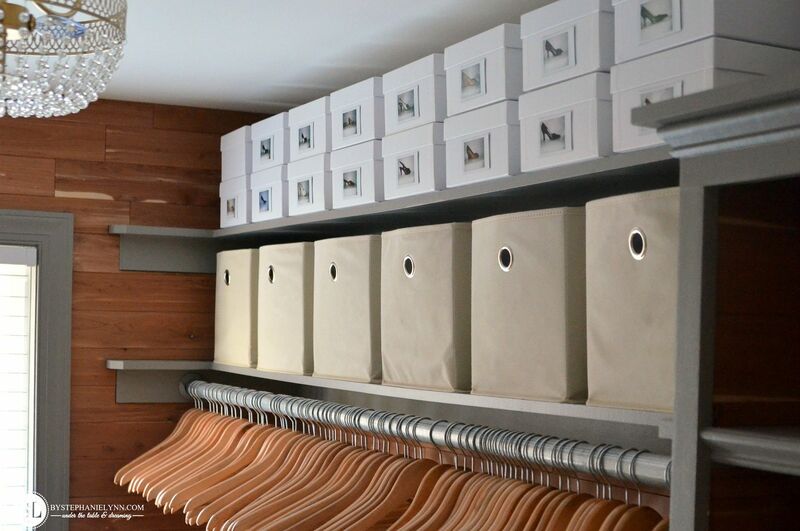 First up this year is our master bedroom and closet. After an enormous purge last year, we embarked on a total makeover for this space – including fresh paint, an amazing cedar lining and some new added accessories. I have been so thrilled admiring the beauty that I’ve been a little hesitant to fill it back up. I’m starting small though and beginning with some Shoe Storage Organization. and this months Michaels Makers Fresh Start Challenge. 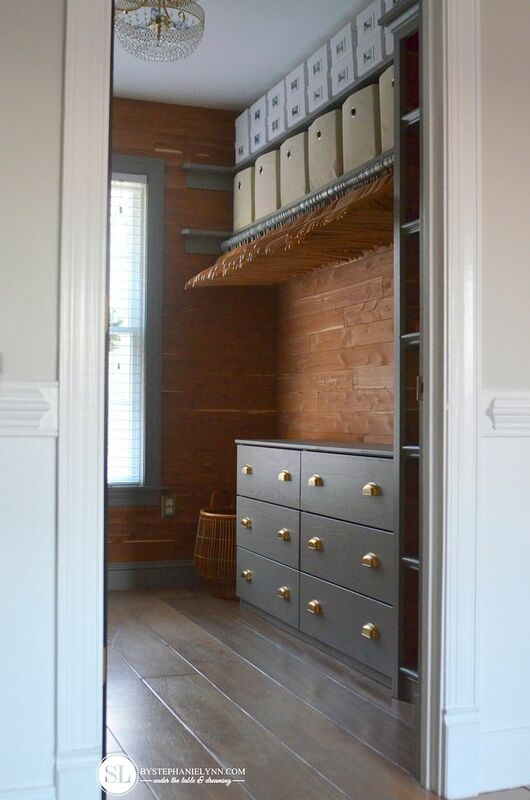 Everyone knows storage is king and as far as the closet goes, I’m trying to capitalize on every inch of space – from the floor to the ceiling. I love the idea of everything having its own little space, primarily by tucking things away in boxes, baskets, and bins. 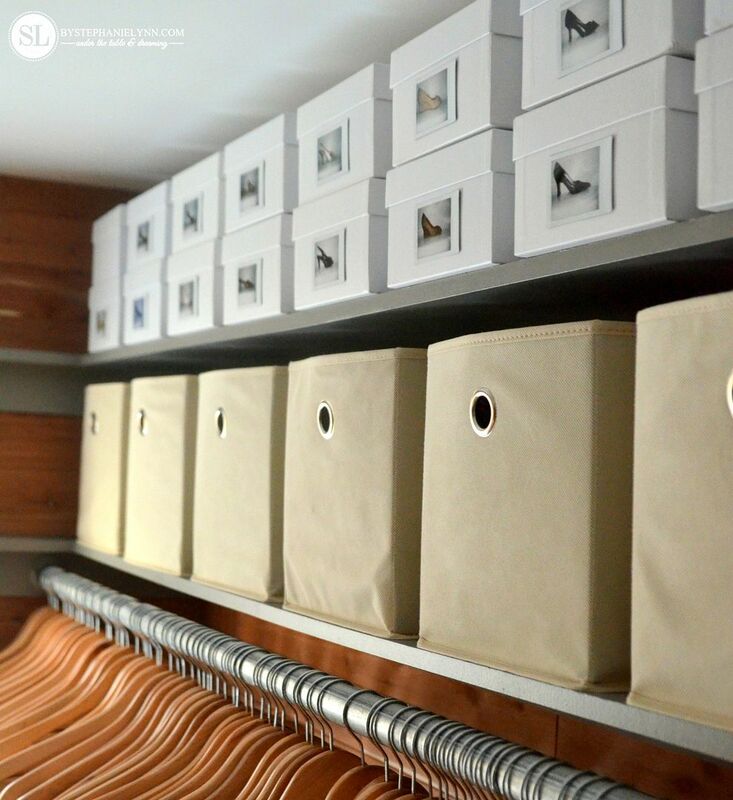 This not only helps us keep things organized, but also conceals any clutter – creating a uniformed look throughout the closet. 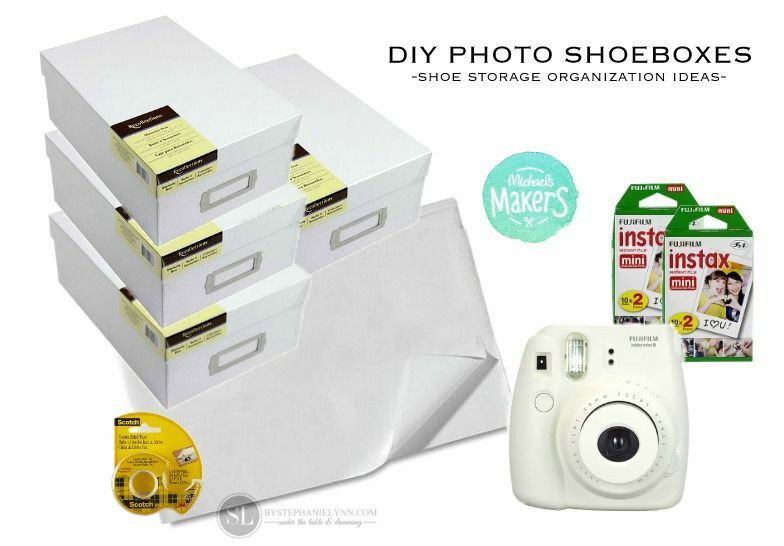 These photo shoeboxes are inexpensive to assemble (even if you don’t already own an instant camera) and a perfect solution to combat a good portion of our Shoe Storage Organization. 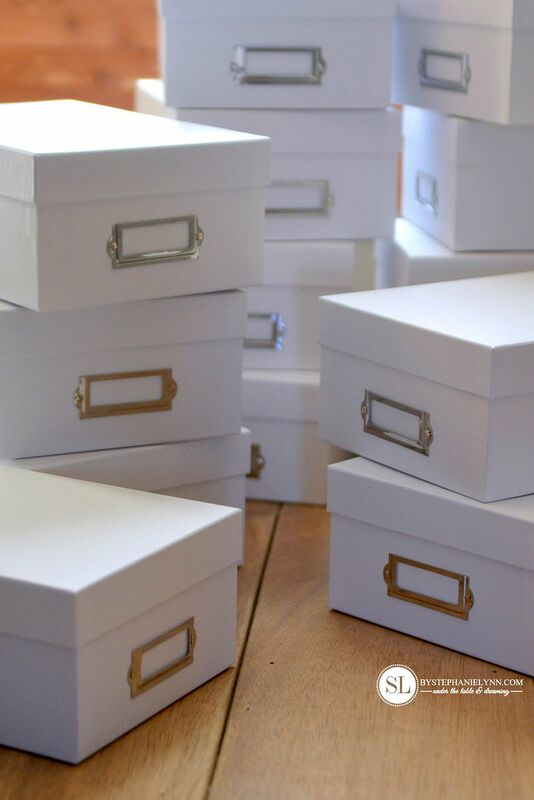 The white storage boxes are actually inexpensive memory boxes from Michaels. These particular boxes come in an array of different colors and patterns and are nice and sturdy, ensuring a long time use. 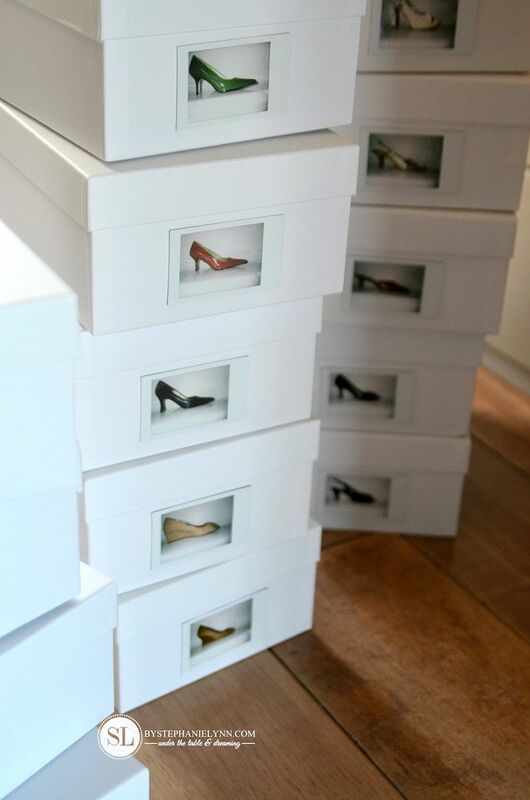 Each box was lined with white tissue paper to help protect the shoes from rubbing together. 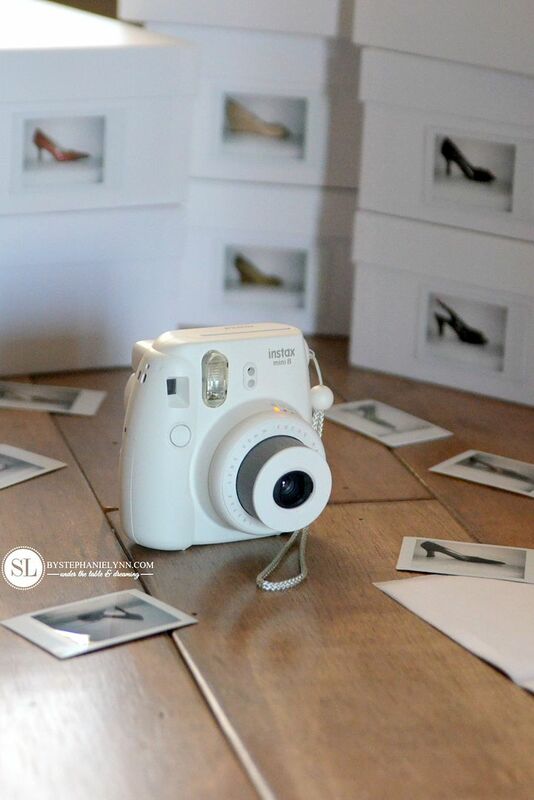 The photo labels were created using an Instax Mini Camera. This particular camera produces a credit card size photo in just 90 seconds. My little guy thinks this thing is the coolest! 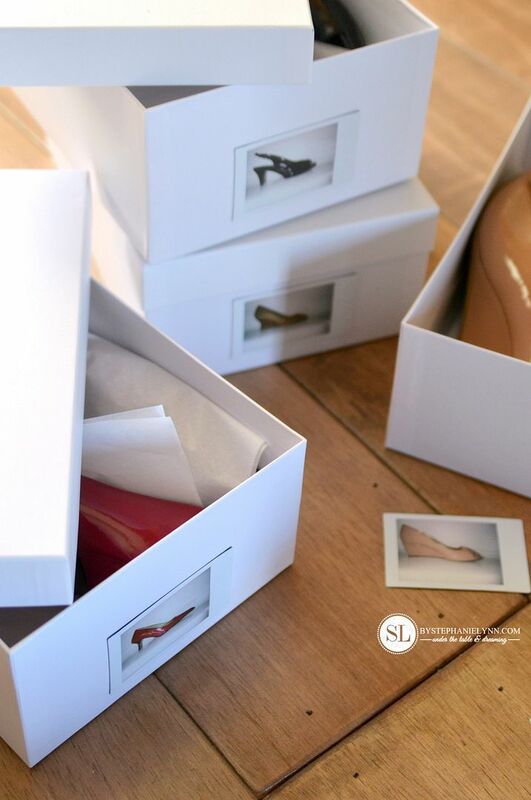 The labels identify which shoes are in what box and helps keep the Shoe Storage Organization pretty and easy with a coherent look. 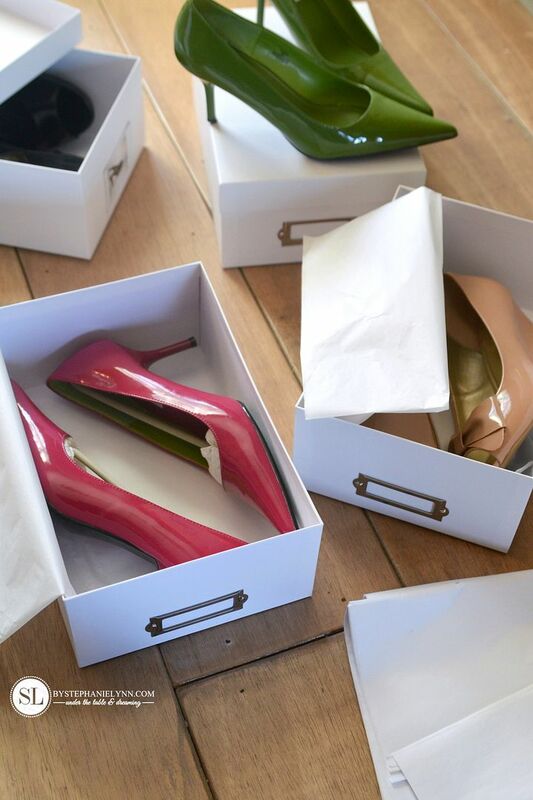 Plus it will only take a few minutes to add any new shoes to the collection in the future. Permanent double sided tape was used to attach the photos to the storage boxes. One side of the box has a metal label holder, so I simply used the opposite side for the photo. The same idea could easily be recreated with printed photos if you do not have an instant camera. Here is a little peek into the closet. As I mentioned before, I have been very apprehensive about what is going to go back into this space so I am taking my time purposely refilling it. Are there any organizational projects on your list this year? This post is brought to you by Michaels . The opinions read here are entirely my own. Whether it’s planning the family schedule, cleaning out your pantry or getting the kiddos ready to head back to school, Michaels has everything you need to help you get organized this year. Make a fresh start in the new year and plan for a great 2017! Michaels has a huge selection of planners as well as all of the accessories you need to personalize your own. 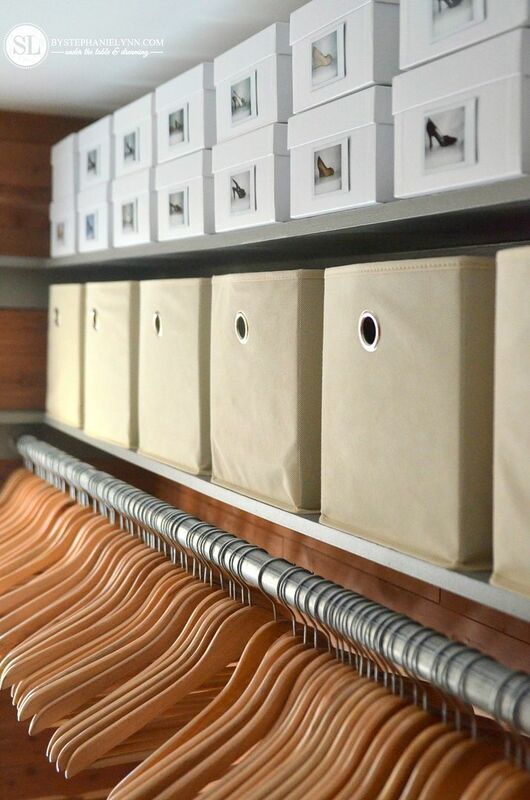 Looking for more organization inspiration? 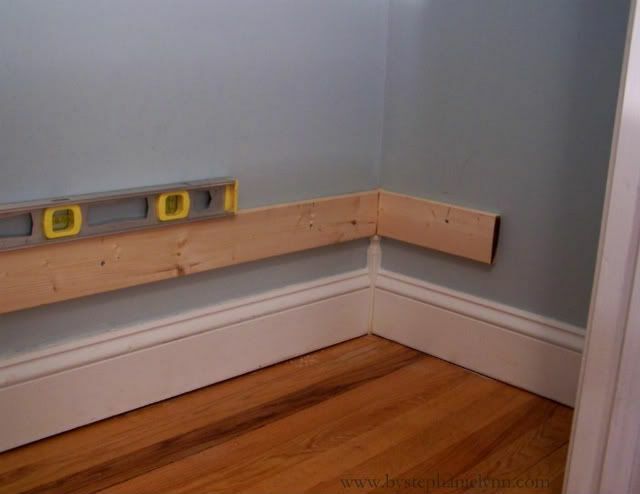 Make sure you visit Michaels’ blog, The Glue String, to see the rest of the Michaels Makers’ organization project ideas. Happy New Year and Happy Organizing! Such a great idea! love using that camera for this. 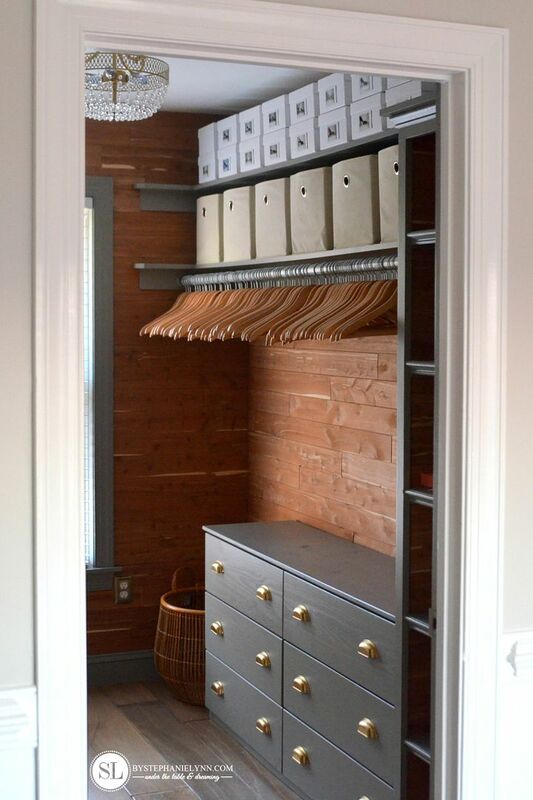 And can we talk about that closet. So envious. Looks amazing. 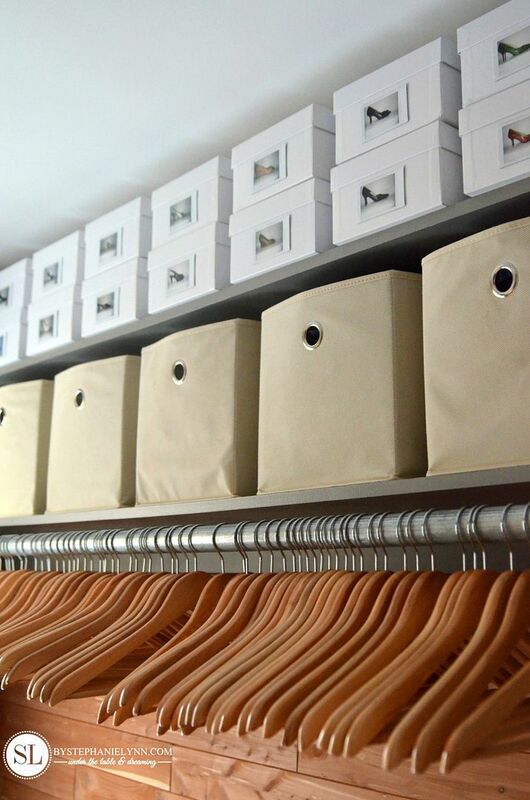 Wow, what an incredibly incredible closet. Hey if you’re going to snazz up your closet might as well really snazz it up, love it. Wishing you and yours Happy Happy New Year and great health thru-out the year. Doggone it knew should have bought that cute little Instax camera when was on sale at Michaels. Beautiful… We need more please. More projects, more ideas, more you! I am at the shoe heaven and this closet… oh my God, it looks enormous! Great idea with the little photos! wow, talk about organised, what a great idea, especially the photos on the front of the boxes. Having an organized space is so great. Not only does it lend to less stress and calm it also makes the home decor and architecture of a space stand out. This is a great idea! 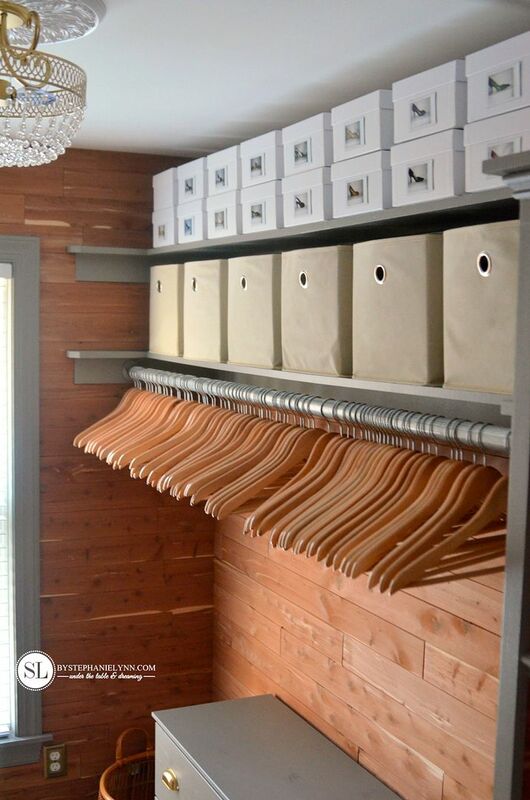 I hate seeing shoes thrown into closets, this is a great way to stay clean and organized while still knowing where things are.